Get the most out of Africa Day 2018! Minister of State for the Diaspora and International Development Joe McHugh T.D. has today (06.04.17) announced that a national flagship event to celebrate Africa Day 2017, supported by Irish Aid, will take place in the grounds of Farmleigh Estate in Dublin’s Phoenix Park on Sunday 21st May from 11am to 6pm. The Dublin Africa Day event will feature free public performances by well-known African and Irish musicians, children’s entertainment, traditional African drumming and dance workshops and cultural performances. Launching the Africa Day 2017 programme, Minister McHugh said: “Irish Aid’s Africa Day flagship event at Farmleigh is a great occasion for families and friends to celebrate African culture and the strong bonds that exist between Ireland and the continent of Africa. “Irish Aid has been working in Africa on behalf of the people of Ireland over several decades to deliver improvements in the areas of nutrition, education, poverty eradication, gender equality and the environment and also in response to humanitarian emergencies. This work is built on the contributions of Irish missionary nuns and priests who were the bedrock of relations between Ireland and Africa in the first instance. Their footprint has enabled relations to continue to grow in an authentic manner, underpinned by trust and respect. “Trading relationships between Ireland and countries throughout Africa are also developing steadily and many exciting new opportunities for economic growth are emerging. In Dublin, renowned Irish folk group, Kíla will headline the main stage as part of a line-up which will also see performances by: K.O.G. & THE ZONGO BRIGADE, the UK based nine-piece Afro-fusion group who have played Glastonbury main stages as well as many other UK and European festivals and venues; Ireland’s leading intercultural choir, Discovery Gospel Choir; “melty rock” and agro-soul band, BARQ; and Aik J, a Dublin artist who unites the genres of hip-hop, R&B and pop with a soulful style. There will be three stages of musical performances, as well as an area for dancing and drumming workshops and storytelling. Other highlights will include an African bazaar with food, hair-braiding, turban and head wrap workshops, face-painting and traditional fashion designs from a range of African countries. African Community Groups and a number of NGOs will attend on the day, as will the Embassies of Egypt, Ethiopia, Kenya, Lesotho, Morocco, Nigeria, South Africa and Sudan. A dedicated ‘Mount Kiddimanjaro’ children’s area will feature amusements and funfair attractions to keep younger visitors entertained. Reflecting Irish Aid’s commitment to the UN Sustainable Development Goals, attendees at this year’s Africa Day in Dublin are encouraged to leave their cars at home and instead take public transport, walk or cycle to Farmleigh. 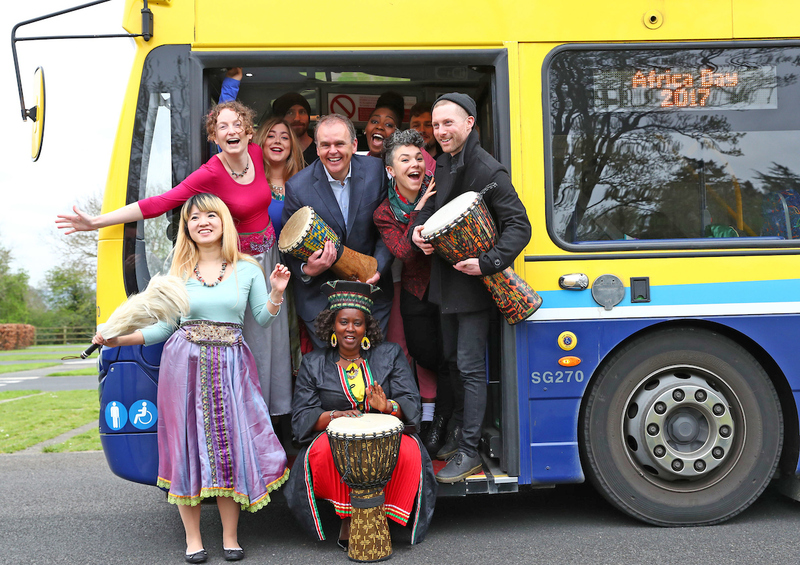 To support this, Irish Aid will be providing bicycle racks at this year’s Africa Day event and Dublin Bus will once again offer a free shuttle bus service, operating from 11am to 6pm on the day between Heuston Bridge/Parkgate Street and Farmleigh. For more information, visit www.africaday.ie. Máirtín Cronin, Department of Foreign Affairs and Trade Press Office: Tel: 01 408 2274. For information on Africa Day 2017 events and interviews with Africa Day Champions: Louise Archbold / Sarah Harte, DHR Communications: Tel: 01-4200580 / 087-2601145 / 087-9858259. Irish Aid is the Government’s programme for overseas development. It is managed by the Development Cooperation Division of the Department of Foreign Affairs and Trade. Further information is available at www.irishaid.ie. Raising awareness of the potential for bilateral trade and investment linkages between Ireland and African countries. Visit http://africaday.ie/galleries/for pictures from past Africa Day events. Africa Day is also on Twitter @AfricaDay, on Facebook at www.facebook.com/africadayireland and on Instagram @africadayireland – Hashtag: #africaday2017. Timi Ogunyemi, freelance photographer, blogger and founder and editor of creative collective Picture This!. Timi was born in Lagos, Nigeria and came to Dublin as a 15 year old in 2002. Salome Mbugua, founder, former CEO and current president of AkiDwA, the national network of migrant women living in Ireland. Salome is a native of Kenya and has lived in Ireland since 1994. Onai Tafuma, a college student and dancer who has both performed and MCed at Africa Day in the past. Onai is originally from Zimbabwe and moved to Ireland when she was two. Three music stages featuring international and home-grown acts:this year will see the Africa Day main stage headlined by the internationally renowned Irish folk / world music group Kíla; Ireland’s leading intercultural choir, Discovery Gospel Choir; “melty rock” and agrosoul band BARQ and nine-piece Afro-fusion group O.G. & THE ZONGO BRIGADE who will be flying over from the UK especially for Africa Day 2017. There will also be a dedicated rap and hip-hop stage. African Bazaar: featuring stalls from different African countries, offering food, drumming, dance, hair-braiding, henna hand-painting, traditional fashion designs, and lots more. In addition to African community groups, a range of development NGOs will be present in the bazaar, offering fun activities, while the African embassies in Ireland will also be represented at the event. Mount Kiddimanjaro, dedicated children’s area: featuring a fun fair, face-painting, drumming workshops, sports and more. Dublin Bus will provide a free shuttle-bus service from the Heuston Bridge / Parkgate Street bus stop into the Phoenix Park. Africa Day visitors are asked to leave their cars at home, and take public transport, walk or cycle to Farmleigh. The Irish Timeshas once again teamed up with Irish Aid on an African-themed writing competition for Africa Day 2017. The national competition is designed to showcase emerging talent, as well as established writers. More information on the competition is available here. 80 Francis Street, Dublin 8. Africa Day Dublin is a family-friendly outdoor event. Sale or consumption of alcohol is strictly prohibited.